Really, the only way to improve upon this rich, thick and flavorful soup is to serve it with toasted cheese sandwiches. Oh, just go ahead and do it! Enjoy! In a large soup pot, sauté the diced celery, onion and garlic in 4 Tablespoons of butter over medium heat for about 10 minutes, until fragrant. Add the tomatoes, the broth and ½ of the chopped basil—about ¼ cup. Bring to a boil, stirring occasionally and being careful of the spatters. Cover the soup pot; reduce heat to medium-low and let simmer for about 15 minutes, stirring occasionally. In a blender, add about 2 cups of the soup and the softened cream cheese. Being very careful of the hot liquid, blend slowly and thoroughly until cream cheese is completely incorporated, about 1 minute. Then add the cream cheese mixture, agave nectar, if using, and remaining basil and butter to hot soup and stir until combined. Add salt and pepper to taste. Serve immediately with a small dollop of crème fraîche. 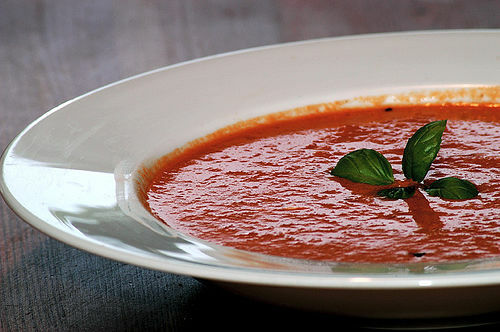 Subscribe to comments with RSS	or TrackBack to 'Roasted Chunky Tomato Basil Soup'. Even better the next day, or the day after that! Like a good wine, it gets better with age! Thanks J!